The learning walk that I planned to take at the beach turned into a bottle walk — many single-use plastic bottles littered the shoreline all along my way. I gathered up at least sixteen bottles in less than an hour and photographed each one where I found it in order to document it for #Litterati, a crowdsourced Instagram project designed to help reduce littering. As I walked, I continued to contemplate how the Litterati concept could be used to build awareness around social justice and education. The students that I work with (and all students) need a crowdsourced movement to fight for them. Kim Douillard has also written about taking this type of action. Will you join us and help create a way to crowdsource our cause? 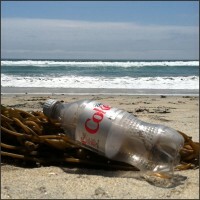 This entry was posted in #Litterati, Photography, Teaching and tagged Instagram, SDAWP Voices. Bookmark the permalink.